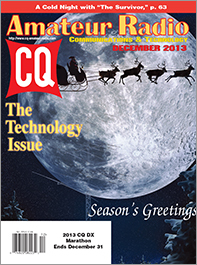 The December issue of CQ is our annual Technology Special, with a focus this year on getting a better understanding of the technology we use. We start out with a visit to the World Maker Faire in New York, which CQ Editor Rich Moseson, W2VU, describes as "just like Dayton, only different!" Next, Yannick Devos, XV4Y, looks at combining the Texas Instruments MSP430 "LaunchPad" microcontroller with an integrated development environment known as "Energia" and the ham projects he has begun to build with them. Peter Livingston, W3CRI, gives us "A Look Under the Hood" of antenna modeling software, explaining that the theory behind these programs goes back to the very earliest days of radio. Dennis Lazar, W4DNN, takes a tongue-in-cheek look at six reasons to collect vintage gear and keep it operating, in his article titled, "Gearing Up for 'The Pulse'." And Gary Geissinger, WA0SPM, shows us how to measure high currents and low voltages without spending a fortune in his "Inexpensive Four-Wire Measurements for the Radio Amateur." Stepping away from our Technology Special, Bob Leo, W7LR, brings us the story of how he helped a ham in Belgium make contact with a centenarian YL in the U.S., in "103 104." We also have the rules for the 2014 CQ DX Marathon, featuring a new competition category, the Limited Class, and a few other rule changes. Remember, the 2013 Marathon ends on December 31 and logs must be submitted by January 10, 2014 (this is a new deadline). We also have our annual index in this issue, for quick reference to every article that appeared in CQ during 2013. An updated Master Index from 1980-2013 will be posted here on our website in the near future. Among December's columns, "Math's Notes" editor Irwin Math, WA2NDM, takes us back into our Technology Special theme with his plans for "A Simple Dummy Load." Several other columns maintain our technology focus this month as well, including Kit-Building Editor Joe Eisenberg, K0NEB's "Cold Night with the 'Survivor," a follow-up on 3D printers by Digital Editor Don Rotolo, N2IRZ, and a look behind the scenes at the Maker Faire from Makers Editor Matt Stultz, KB3TAN. In addition, Public Service Editor Richard Fisher, KI6SN, looks at ham radio response to fires and floods in Colorado and California; QRP Editor Cam Hartford, N6GA, samples some "Tasty QRP Goodies," and "Learning Curve" editor Ron Ochu, KO0Z, suggests a few Christmas accessories for the ham shack. International Editor Tom Smerk, AA6TS, reports on the Mongolian national team taking home the gold from the IARU Region 3 Amateur Radio Direction Finding championships; VHF-Plus Editor Joe Lynch, N6CL, examines a lunar dust experiment that may have influence on Earth's magnetic field and VHF propagation; and Awards Editor Ted Melinosky, K1BV, looks into several "pennant awards" offered by radio societies in Europe. 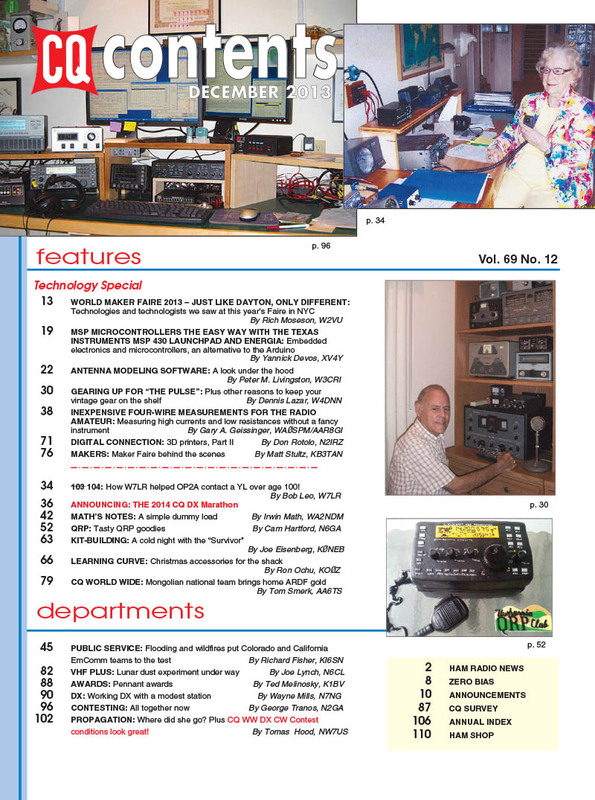 DX Editor Wayne Mills, N7NG (who should be operating Z81X in South Sudan at the time we post this), reports on "Working DX with a Modest Station;" Contesting Editor George Tranos, N2GA, writes integration of all the technology in your ham station in "All Together Now," and Propagation Editor Tomas Hood, NW7US, asks, "Where Did She Go?" explaining why some people may mysteriously disappear in the middle of a contact. Tomas also predicts that conditions for the CW weekend of the CQ World Wide DX Contest at the end of November will be "good to excellent." That's a brief look at what's coming up in the December issue of CQ magazine, which should be on newsstands and in subscribers' mailboxes by late November to early December, and in digital subscribers' online libraries as of December 1. For information on becoming a CQ subscriber, click here. Happy holidays from all of us at CQ! 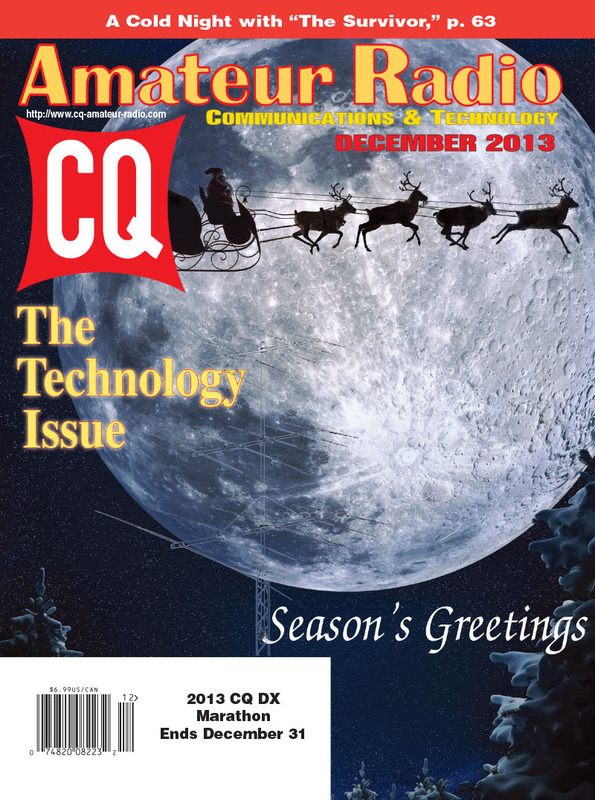 Zero Bias - "Communications and Technology"
On the Cover: Happy Holidays from CQ and Santa to hams all around the world (and even on the moon)!